This is fabulous Sylvie and I'm always so jealous of the view behind the card too! Hi Sylvie, gorgeous card, really pretty. A smashing mix of papers too! Hope you've recovered, I see it may take a little longer for the finances though!!! this is a darling little easter card! Love all your papers mixes. It qualifies for the ABC DT Easter Challenge, do hope you will enter your card for a chance to win a gift certificate. 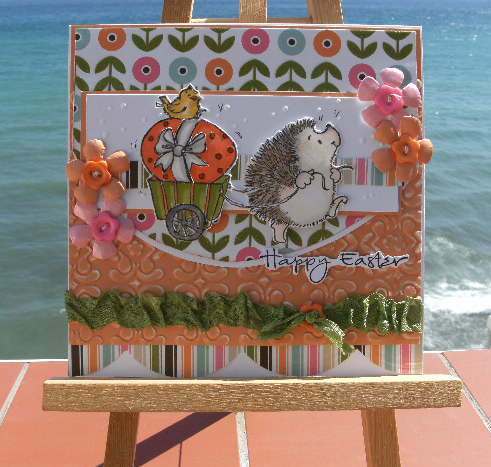 Great card and lovely colours , the flowers look as if they are there to stop the hedgie from walking into the sea. The most beautiful Easter card Ive seen today, stunning Sylvie! Cute card and love your Penny Black image. Happy Easter and thanks for joining us at ABC DT Challenge. I hope you'll come back and join us again next month.